More than a decade after the appearance of nuisance algae around Sleeping Bear Dunes National Lakeshore and throughout Lake Michigan — followed by mass bird die-offs that would be linked to the algae — researchers working at Good Harbor might have found a way to get rid of Cladophora algae, at least in localized areas. Harvey Bootsma, an associate professor at the University of Wisconsin-Milwaukee’s School of Freshwater Sciences, led a team that scraped quagga mussels from rocks in a 40-square-meter area in the summer of 2016. The work is part of a project to study Cladophora at Good Harbor with funding through the Great Lakes Restoration Initiative. Two years later, not only have the mussels not returned, but the Cladophora algae is also missing in action, replaced with a diatom algae that better fits into the food chain and is not considered a nuisance. Chris Otto, a Sleeping Bear biologist, said the finding could be significant. Bootsma was asked to come to the park a decade ago to help figure out what was going on with the Cladophora suddenly mucking up the National Lakeshore’s otherwise pristine beaches. Bootsma had been studying the problem of nuisance algae in Lake Michigan near Milwaukee. But the work soon expanded to include studying the connection between Cladophora and the avian botulism that was causing bird die-offs up and down the Lake Michigan coast. That led Bootsma to focus on the food web and to the creation of the Good Harbor project in 2010. Researchers wanted to figure out what was eating what in order to figure out how the botulism bacteria was killing the birds. Melissa Duhaime, an assistant professor of ecology and evolutionary biology at the University of Michigan, started working on another piece of the puzzle last year — she set out with a group of students to attempt to understand how Cladophora algae can cause the conditions to produce the botulism bacteria. Last summer, she and 16 students took algae samples back to the lab to see what conditions were necessary to turn a harmless, common spore found almost everywhere into a deadly bacteria. “We took Cladophora that was scraped off of the rocks and brought it back to the lab and subjected it to various conditions,” Duhaime said. Duhaime said she and her students are still working through the data, and they haven’t come to any conclusions, but she hopes her research will one day provide the tools needed to predict when conditions are ripe for an avian botulism outbreak so that, say, Sleeping Bear Dunes park rangers can clear algae from a particular beach once it’s been deemed vulnerable. While a definitive connection still hasn’t been made to answer the question of howCladophora creates botulism, researchers suspect they know where it’s happening. Off of the picturesque shore, underneath the glistening water, Bootsma and his fellow researchers developed a suspect in the bird deaths — deep holes in the lake bottom that collected and trapped dead algae, turning it into a disgusting and potentially deadly muck. “It is like a nasty little stew — a mixture of all kinds of dead fish and all other things, just death,” Otto said. 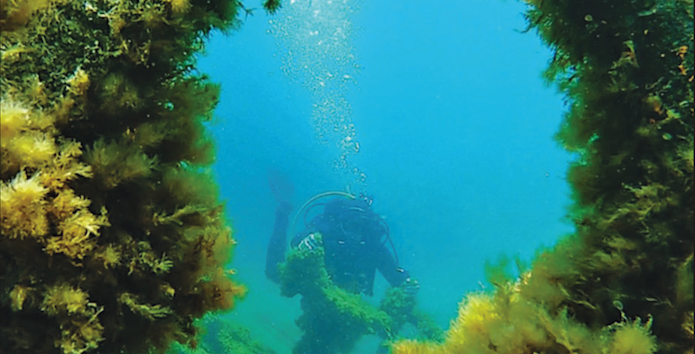 Botulism bacteria exist all over the place in a dormant, harmless form, but in these deathly undersea Cladophora holes, conditions are ripe to turn those spores into active botulism. To realize its deadly potential and become toxic, botulism needs lots of nutrients and a dearth of oxygen, and that’s exactly what rotting piles of Cladophora offer. Once the toxic bacteria have been cooked to life, macro-invertebrates and mussels might eat it, and then perhaps they are in turn eaten by mussels, fish, or birds. By the time the bacteria has made its way that far up the food chain, the results are deadly. These are suspicions, however. The scientists studying what’s going on at Good Harbor are still looking for proof, so that they can say definitively what’s happening. “We did a fair bit of work on that, but we still don’t have a smoking gun or a strong answer to that question,” Bootsma said. The dead algae heaps, though, are truly disgusting. Bootsma remembers the first time he dove on one in scuba gear that, while he was underwater, protected him from the rotten stench. It was the study of the food web — and wanting to understand how the quagga mussels fit in — that led Bootsma to set out to clear an area of rock of mussels in order to see what would happen. The quagga mussels, of course, started the whole problem in the first place; they’ve changedLake Michigan by turning it into an environment ripe for algae production. The do it in two ways: clearing the water by eating all the plankton, which enables sunlight to reach lower depths and making it easier for algae to grow, the processing available nutrients into what’s essentially plant food. “They are clearing the water for more sunlight to penetrate, but they’re also fertilizing the bottom,” Otto said. The discovery that quagga mussels still have not returned to the 40-square-meter area they were cleared from surprised Bootsma. Now he wants to repeat that experiment on a larger scale, perhaps over hundreds or thousands of square meters. It’s hard, labor intensive work, though. “It would be impossible to treat that whole area,” he said. “It took us quite a bit f work in 2016 to clear this area, and that was partly with the help of volunteer divers who were working with us,” he said. Bootsma has a hypothesis as to why the quagga mussels haven’t returned. He believes that the small quagga mussels that attach to that rock are simply being eaten by another invasive species, the round gobis, before they have a chance to grow into large quagga mussels. So what could this development mean for Cladophora in Lake Michigan? It’s unlikely to think of a project that would remove all of the mussels from Lake Michigan, unless some unforeseen profit motive came along. Below 65 feet, the mussels are left undisturbed enough so that they can attach to the sand. Bootsma said the deep parts of Lake Michigan are blanketed with trillions of the shelled creatures. Bootsma could see them being used as fertilizer or in pet food. On a smaller scale and in targeted areas, however, this development could be used to target areas with high Cladophora production, or be triangulated to eliminate Cladophora that has been associated with bird die-offs, to keep the algae away from marinas or popular beaches, or to protect fish spawning habitat. On the surface, at least, Lake Michigan looks the same as anyone can remember, if you stand on a beach and look out over the water. If you look underneath, that’s not at all the case. Over the last decade, Bootsma said he has had the extraordinary experience of studying a problem in an ecosystem that is changing before his eyes. That’s because of the profound impact quagga mussels have had on the lake. Simply by filter-feeding all of the plankton, clearing the water of any tone or color, and recycling nitrogen and phosphorous into a form that can feed Cladophora algae, quagga mussels have fundamentally changed Lake Michigan. Bootsma is hesitant to make predictions about what’s going to happen next to the lake, but he said he’s seen signs that perhaps the conditions that led to the production of nuisance algae — and, by extension, avian botulism — could be receding. “We’re starting to see now that it might not be as bad as it was in the early days,” Bootsma said. One reason for that could be that the mussel population is running out of food and, in the future, might not be able to support itself. Bootsma hopes that no new transformational invasive species make it into the Great Lakes. Stricter ballast water rules for the shipping industry seem to have staunched the flow so far, he said. “If we can do that, then we can start letting Lake Michigan return to a steady state,” he said. Jeanie Williams, lead scientist and education specialist at Inland Seas Education Association, said the story of how quagga mussels spawned a Cladophora outbreak that led to avian botulism is a great example of why it is so important to keep invasive species out of the Great Lakes. Torch Lake is famous for its crystal clear, azure waters. A couple years ago, an unsightly golden brown-tinted organism decided, for some reason, to crash the party. Now people who live around Torch Lake have their own algal mystery to contend with. The appearance in Torch (and Clam and Bellaire lakes) of the golden brown algae prompted enough concern that the Three Lakes Association set out to determine what had changed that could have fostered the growth of this algae. Becky Norris, who headed up the project for the association, called the algae a canary in the coal mine, a warning that conditions in the lakes were changing — and if they didn’t figure out how, the conditions could enable the algae to take over. Three years and numerous studies later, the source of the algae remains a mystery. Like with cladophora, the algae in Torch Lake is native, and it’s supposed to be there — just not so much of it. Unlike cladophora, the golden brown algae does not become toxic and has not been associated with avian botulism. The algae’s sudden boom could just be a reaction to so much recent development around the lakes, including more densely packed neighborhoods and larger homes. If researchers can conclude specifically what the source is — that it’s, say, septic drain fields discharging nutrients into groundwater, which is then getting into the lake — that would at least give association members the information they need to start a conversation about how to solve the problem.